Luang Prabang is often the first town that visitors head to whilst travelling through Laos. Although not the capital, this sleepy city is popular with travellers because of its impressive waterfalls and Pak Ou caves. Situated in Northern Laos, this old French town is famous for the daily giving of alms to the Buddhist monks in their bright orange ropes. Every morning locals line the streets to offer cooked rice to the monks before they head off to start their day. The city has a population of just over 400,000 people, and has been a listed UNESCO World Heritage Site since 1995. It's incredibly easy to travel to, with many travellers arriving from Thailand through the Huay Xai border crossing, or from Vang Vieng or Vientiane in Laos. Here are ten things you must do whilst visiting Luang Prabang! We arrived in Luang Prabang in the early hours of the morning after a twenty hour journey from Chiang Mai. The room that we had pre-booked wasn't ready so we spent some time hanging out by the river and watching all of the boats go by. It turned out to be really lovely way to spend an hour - especially after a very long bus journey. A fun way to explore the town is by hiring bicycles. It's a super cheap activity, and allows you to see more of the city than you otherwise would on foot. Every year a family rebuild this bamboo bridge after it gets destroyed in the wet season. Tourists pay a small fee to walk across the bridge, which is definitely a unique experience. Whilst hiring bicycles in Luang Prabang be sure to cycle across the communist era bridge - a bridge much more permanent than the bamboo bridge! Alongside the Mekong River and opposite Mount Phousi is the Royal Palace, which was finished being built in 1908. Every morning locals line the streets to offer cooked rice to the monks before they head off to start their day. It's a tradition that dates back centuries, so if you go to watch please be respectful. Dress appropriately and keep your distance from the ceremony. For a chilled out place to grab some amazing food and a drink, head to Utopia. This restaurant is right on the river bank of the Nam Khan River, and has cushions on the wooden floors for guests to sit on. For unrivaled views of the city climb to the top of Mount Phousi. 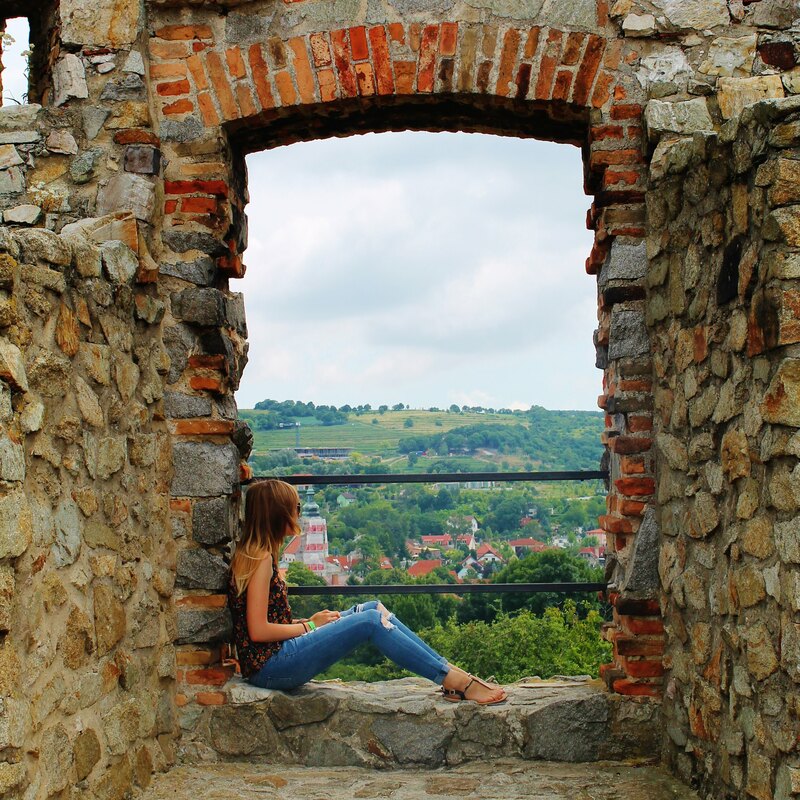 You'll need to climb hundreds of steps, but it isn't too steep, and the views are definitely worth it. Go earlier in the morning or in the late afternoon to avoid the mid-day heat. Every evening Luang Prabang comes alive and hosts a brilliant night market. One of the highlights is the street food vendors offering all you can eat buffets. Fill up a plate (it costs around £1.50) and enjoy! Saving the best till last! 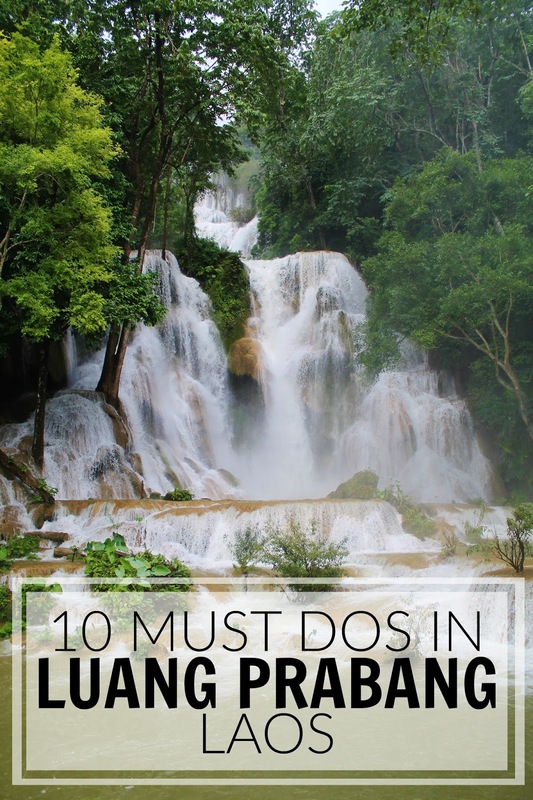 One thing you must do whilst visiting Luang Prabang is to hop in a tuk-tuk and head to Kuang Si Waterfall. You can haggle a return price and the driver will wait at the waterfall until you're ready to head back. Be sure to give yourself a few hours to explore this impressive waterfall - especially if you climb all the way to the top! If its been raining, be careful on your way back to the bottom as it can get slippery. I found out the hard way, and slipped right in the mud... much to my other half's amusement! If you're got more time in Laos head down to Vang Vieng, a beautiful small town surrounded by mountains. The bus journey between Luang Prabang and Vang Vieng takes around three hours and is one not to be missed. The scenery you drive through is stunning, so be sure to have your camera at the ready.